Last month I read Sybil MacBeth’s Praying in Color(Paraclete Press, 2007). 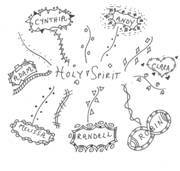 In that book, Sybil Macbeth tells about her method of doodling her prayers. A number of Sybil’s friends had cancer and in the process of lifting them up through intercessory prayer, Sybil took pen to paper and created a visual representative of her prayer.She then offered some other creative ways of using the same method to maintain focus in other forms of praying (praying for discernment, using scripture, etc.). As an occasional artist and compulsive doodler, I enjoyed it a lot. In Praying in Black in White, Sybil has teamed up with her husband, Episcopal priest, Andrew Macbeth to offer an updated look at the methods she prescribes in Praying in Color, with an eye to aiding men in prayer. Sybil lays out the method of doodling prayer she first presented in her earlier book. Andy explores the way men are wired and the peculiar gifts and challenges they have when they set out to pray. He also shares his experience of prayer and praying in this method. So what is the difference between ‘praying in color’ and ‘praying in black in white?’ Are men’s prayers less colorful? Essentially, the method is the same, though simplified. In Praying in Color, Sybil suggests the use of colored markers in prayers, here, a pen and paper are all that are necessary (though journals and graph paper are suggested). I think Andy and Sybil are trying to make this method as accessible as possible for men. I don’t know what the exact statistics are, but women on average are better pray-ers than men (just like there are more women in church, more women read their Bibles, more women describe themselves as spiritual, etc.). Either book would describe the basic method, what this book does is tailor the message specifically to men. In terms of describing the method, I think Praying in Color does a better job (which may be because I read it first). But Praying in Black and White has some helpful comments directed at us guys when we come to pray. In Andy’s chapters of this book, he discusses the challenges he has in coming to prayer as a man. These include his desire to feel like he’s doing something significant and not wasting his time, the ways his prayers feel superficial and, well, boring. But he also shares how he comes to prayer to put his life in context of something bigger than himself, to deal with anxiety, to reach out to someone greater than him to meet the needs of those he loves, because he cares deeply about his world, and desires to anchor himself to God and unite himself with others. While Andy’s experience in prayer is not necessarily universally applicable to all men, he does pick up on some characteristics of masculinity and how men are socialized. He claims that men bring to prayer their independence and self-sufficiency, their task-oriented nature, and their goal focus. He also discusses how we learn through concrete experience, physical movement and how we do our best work in groups. But there is a fairly big variety in what these can look like (hence doodling). and it could comprise several pages as you go through various stages of prayer (like Sybil’s description of using doodles in Lectio Divina). They also provide reflections on barriers to this sort of prayer (honestly it won’t work for everyone which the Macbeth’s readily admit) and they discuss how to use this method in leading prayer groups. As I said, I think that this method of prayer is helpful in maintaining focus on prayer and calling you back to prayer (much like a breath prayer, which they also discuss how to doodle). Parts of this book I think are more helpful than others. I personally like to use the scripture throughout my practice of Lectio Divina, whereas the Macbeth’s use the Biblical text as a jumping off point. I find that too subjective for my tastes though I would acknowledge that people can follow their steps and have a fruitful experience of prayer. As a short book, this is ideal for a guy (or the guy in your life) who wants a quick encouragement and method for prayer. Regardless of whether you follow all of the Macbeth’s suggestions (I don’t) or agree with them on every point (I don’t) you will find good food for thought and encouragement to enter more fully into prayer. Thank you to Paraclete Press for providing me with a copy of Praying in Black and White in exchange for this review.